Segmental Retaining Walls (SRWs) have evolved from being used in garden and landscape applications in the 80’s, to now being one of the go-to retaining wall choices for residential and commercial projects, state and federal highway projects, and major industrial applications throughout the world. Their reasons for use are plentiful and include aesthetics, design flexibility, efficient and economical installation as well as efficient production with what is known as dry-cast concrete. This method of production (dry-cast) has been used for centuries to economically produce concrete block (like other products such as concrete masonry units (CMUs)) and is the most efficient way to produce concrete products such as Allan Block. Why is it efficient? Concrete block machines are used to automate the process and create product quickly with very tight tolerances. This efficiency is one of the many reasons why Allan Block SRWs have been a designer’s choice for decades. 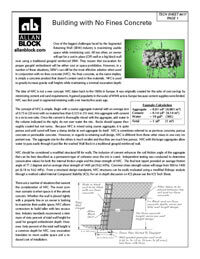 Another option wall engineers sometimes turn to in lieu of a more economical Allan Block product is a “big block.” Big blocks are produced using a wet-cast method of production which relies on a wet mix of concrete to be poured into a mold which must be removed only once the product has been cured – sometimes taking a full 24 hours to occur. Big block production is very slow and entirely dependent on the number of molds a producer has. Many designers will specify big block because they think bigger, heavier face block are better for their projects. One project with such a specification was Pogues Run, a storm water channel in Stinesville, IN. The Civil Engineer on the project was Butler, Fairman & Seufert Engineers (BFS Engineers) who originally specified a big block product. In the case of Pogues Run, the contractor (Milestone Contractors) preferred installing Allan Block walls and knew that Allan Block would be much more cost effective to the client. So, with the help of the local Allan Block Producer, Reading Rock, Milestone asked Civil Design Professionals (CDP) to prepare a value engineered preliminary design to be submitted for approval to BFS Engineers. The preliminary design consisted of AB Classics and geogrid resulting in an installed cost that was approximately half of the big block walls. 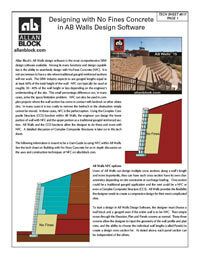 After reviewing CDP’s geogrid reinforced Allan Block design, BFS approved the switch to AB. Because BFS were relatively new to SRW designs they did not know that Allan Block SRWs can easily be designed as water applications in both still and moving water. Once those concerns were resolved. The switch to geogrid and Allan Block was obvious. With Allan Block approved, Milestone Contractors - an AB Certified Wall Installer - mobilized their crew and finished the install in record time. The ease of construction and the inherent cost savings from less shipping costs and smaller required equipment made the Allan Block system the only real option for the owners. The Allan Block products provided the benefits of a high quality design, a lifetime of reliability and an extreme savings in installation costs. There are many misconceptions about big block units versus SRWs due to misinformation. Here are some perceived advantages of big block units. Bigger is better: False - If all walls are designed and constructed properly and based on industry standards outlined in Best Practices for Segmental Retaining Wall Design, they will all perform as required. You can build larger gravity walls with big blocks: False - Allan Block with no-fines concrete (NFC) backfill is considered a gravity wall structure and will have a design depth similar to that of Big Block. Also, the cost of using Allan Block and NFC is consistently $10-$20 a sq ft less than Big Block when comparing material cost and installation. Big blocks can use less geogrid: False - When grid is needed to create reinforced retaining walls the grid length is equivalent for big block and Allan Block walls, roughly 60% of the wall height. Big blocks are better when excavation space behind the wall is limited: False Allan Block with no fines concrete backfill can achieve the same wall heights with similar or less structure depth. With these misconceptions clarified here are some reasons why Allan Block wins versus big block products. 1000s/day for AB vs 1-2/day for big block per mold. Block machines produce higher quality product with a much tighter tolerance for block dimension between units. Approx. 520 ft² (48 m²) per load for AB vs 15-50 ft² (1.4-4.6 m²) for big block. Big block projects need to be produced, staged, shipped and installed in a manner to follow the layout and design parameters of each project. Specific blocks must be shipped at the right time and installed in the correct location within each wall. AB product is simple in that all the product sizes are the same and any unit can go at any spot within the wall which simplifies the scheduling and installation process. Thousands of AB Certified Wall Contractors properly trained on SRW installation. These benefits for Allan Block will most commonly result in a more economical installation cost. Production costs alone may result in up to a 75% reduction when comparing an AB product to a typical big block retaining wall product. When you factor in the additional freight cost due to the additional number of trucks required to ship a big block product, the cost savings can add up quickly. Aside from the lower installation cost, another benefit that is often overlooked is the large group of AB Certified Wall Installers. The Allan Block Contractor Certification Program is designed to give contractors the proper training and tools to ensure top quality retaining walls are built. As a leader in the industry, Allan Block Corporation has developed these tools and training programs to help contractors get the knowledge and the resources they need. With the help of our vast network of trained Allan Block representatives, thousands of professionals have already taken advantage of our installation training, technical support, and the many tools we have available to help them plan, design and build with Allan Block products. Over the past thirty years many evolutions have occurred within the SRW industry. The most common and efficient design method for an SRW still incorporates geogrid to reinforce the soil behind the block facing. However, with the introduction of NFC used as infill behind the block facing, many alternative design options have been created. NFC has become a go-to product when attempting to solve many common site issues. These issues are when an application has limited excavation capabilities such as a cut site near a property line or on a site with limitations behind the wall such as existing utilities. Incorporating NFC may reduce the depth of “cut” needed by up to 50% - typical NFC designs include a depth ranging from 30-40% of the overall wall height. How do you design with NFC? 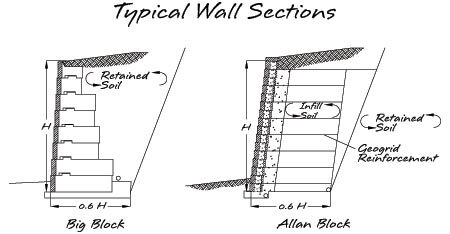 AB Walls, which is Allan Block’s design software, implements the design criteria from Best Practices for Segmental Retaining Wall Design. 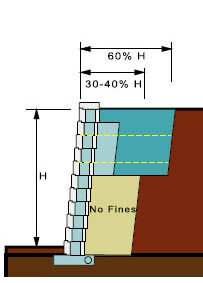 One of the features of Allan Block’s Design Software, AB Walls, is the ability to examine multiple options of reinforcement. 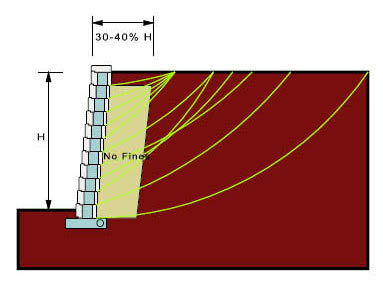 The designing engineer can stay with geogrid reinforcement or NFC for the length of the wall. Otherwise, if space is limited, the designer can change between geogrid and NFC to meet specific size constraints. Designing with AB Walls provides the designer the flexibility to do what they want wherever they want and ultimately to provide a set of plans that will accommodate any site issue. SRWs have become a cost effective and reliable option for virtually all retaining wall projects. SRW design, construction and performance have continued to improve, and much of this advancement has been and will continue to be influenced by Allan Block’s research and development. For more information on AB Walls and NFC see allanblock.com. Use of no-fines concrete backfill has increased our ability to install reinforced retaining walls in locations where typical construction would not be possible because of property line constraints or limited excavation options. There are additional advantages to using the no-fines solution. Contractors are able to build with better production rates and with less manpower. The use of no-fines concrete backfill also eliminates the need for compaction and compaction testing of the reinforced soil. It provides superior wall drainage since the entire mass is permeable; therefore, eliminating the need for wall rock in the cores and behind the retaining wall. This pervious concrete backfill will provide a “solid” solution that can reduce the overall settlement behind the wall. Check out the no-fines tech sheets at allanblock.com for more information.